For the first time since the Broadway bikeway partially opened in October, we’re getting a look at ridership data on Capitol Hill’s signature protected bike lanes. CHS recently obtained Seattle Department of Transportation’s Broadway counter data including hourly bike trip totals from January to May taken from a sensor located between Pike and Union. 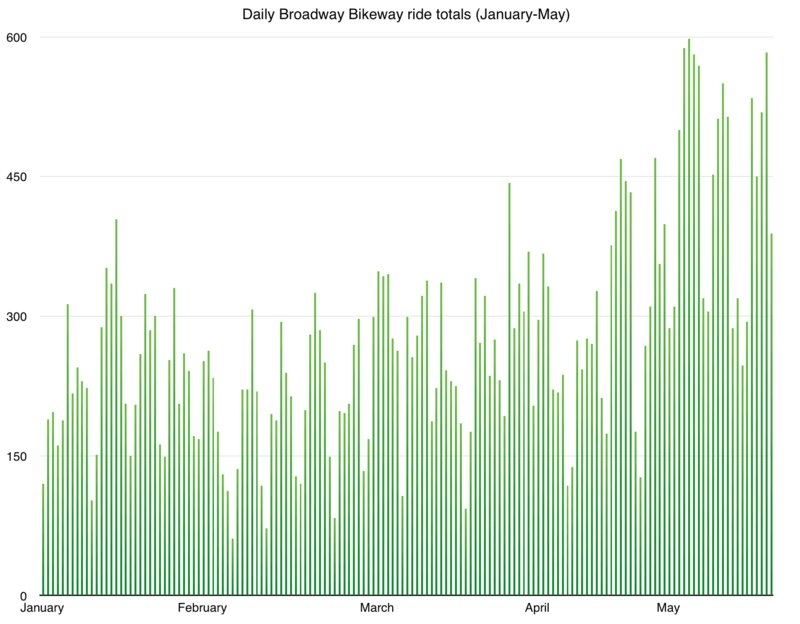 The single most active day in the first five months of 2014 was May 14th, with 598 trips. That was the Wednesday before a drizzly Bike to Work Day, by the way, and a week after the full route of the bikeway finally opened connecting Broadway near Seattle Central all the way to Yesler. Ridership trends appear to be progressing as expected. 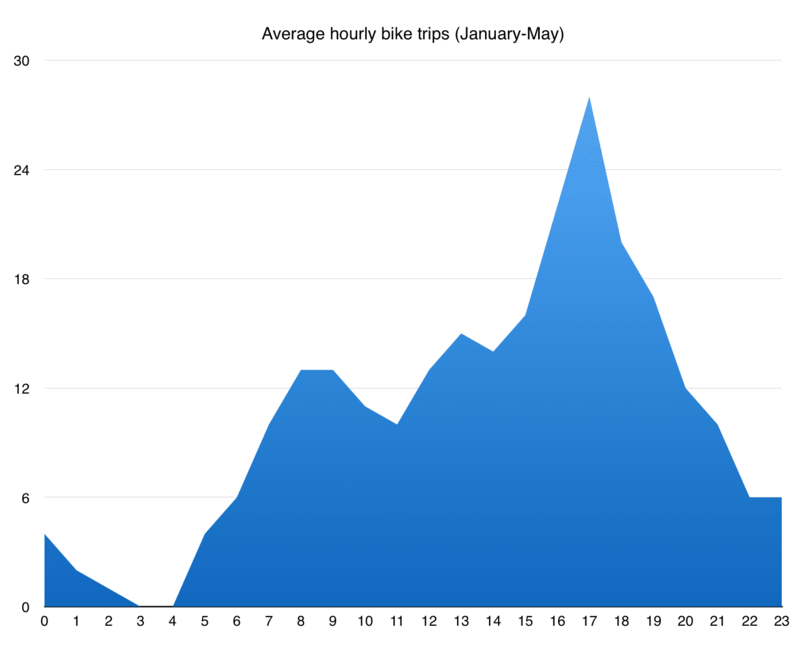 Rides have increased with warmer weather and the most active hour is during the 5-6 PM commute, mirroring trends from other bike counters in the city. Weekend traffic is also significantly lower than during the weekday. According to SDOT, the counter data will soon be available online. Broadway’s two-way protected bike lane stretches from Yesler Way up to E Denny Way, connecting Yesler Terrace, First Hill and Capitol Hill. Big blue bollards protect the route through its core. While the bikeway is significant for being central Seattle’s first protected bikeway through a major commercial area, a handful of accidents have proven there is still no surefire way to prevent car-bike collisions. There is also a decent hill to climb — in both ways — between Madison and Yesler. 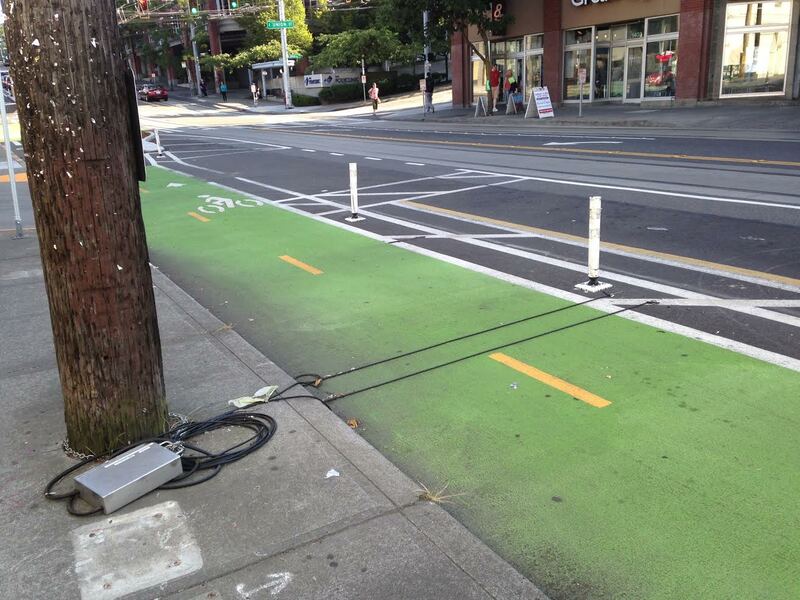 The Broadway bikeway counter, located between Pike and Union, is a small rubber tube that runs across the bike lane and tracks traffic in both directions, according to SDOT’s Craig Moore. Most of the city’s bike counters, including the one on Broadway, require city officials to download the data in person through a Bluetooth connection. There’s no word on whether any of the recorded trips were actually cars passing over the tube — some drivers have had a hard time figuring out the new parking spaces along the route. SDOT is also using a radar counter on the Broadway block, which is embedded into the bike lane’s concrete and will eventually serve as the permanent counter. Moore said there are no plans for a visible counter “totem” like the one on the Fremont Bridge. The city has not set any ridership goals for the Broadway bikeway, but will use the data to evaluate broader biking goals laid out in the Seattle Master Bike Plan. The Broadway bike lane still has a ways to go before it can rival high traffic zones like the Fremont Bridge bike lane, where weekday bicycle trips average roughly 2,000 a day in the winter, and 4,000 a day in the summer. Unfortunately, there’s no good counter comparison to the Broadway bikeway. Moore said that is by design as SDOT attempts to track data across different types of neighborhoods, bikeways, and riders. The Broadway bikeway is part of the larger First Hill Streetcar project, where rail construction has finished and testing of the overhead power lines recently got underway. The streetcar is slated to open in November between Pioneer Square and E Denny Way on Capitol Hill, and will eventually stretch up to either Aloha or Roy. The bikeway will come along for the ride providing a safer route for bikers away from the dangerous streetcar tracks. The bikeway will split to both sides of the street north of E Roy before transitioning to sharrows for the route down to Roanoke Park. This entry was posted in News, etc. and tagged bikes, broadway, stats, transit by Bryan Cohen. Bookmark the permalink. This whole Car vs. Bike War reminds me of the Sunni vs Shia conflict. Meaning it’s stupid. So, so stupid. How have cars been displaced? There was one lane in each direction before the bike lanes and there is still one lane in each direction. Drivers can no longer turn at points they were allowed to make prior to the bike lane installation, thus displacing drivers from their previous routes. So quantify exactly how many cars have been “displaced” please? And how much, precisely, are they “displaced” by having to turn at a slightly different location (not sure what you’re talking about there, but let’s go with it). And the 3 or 4 people who had to turn somewhere different, possibly losing 5 minutes – their time is definitely more important than the safety improvements the cycle track will bring when completed, right? Think beyond your windshield please – Transportation infrastructure is about moving people, and this is clearly an improvement from that perspective – even with the 500 a day users, which most likely is dramatically reduced by the construction complications impacting the track right now. Why don’t you quantify the time in motion studies you seem to have conducted indicating quantity and displacement time. And please prove exactly how much these bike lanes have improved safety on Broadway? Since you don’t have that data, lighten up and don’t take yourself so seriously, Richard. The removal of door zone conflicts, clear marking of bike lanes, independent light timings, and separation from primary traffic – you really think all that won’t improve cyclist’s safety? If you need that explained to you, there’s not really much point in moving forward with this discussion. As for taking myself seriously, you claim limiting a few turns, MAYBE causing 1%-ish of the traffic to have to turn at a slightly different place (which, btw, has more to do with the streetcar than the bikeway, but whatever) is somehow a significant “displacement” of cars. No “time in motion” study is needed to know that’s really not making much difference — you’re just stretching credibility to find SOMETHING to whine about. Sorry, but it’s pretty transparent. The issue is not that cars have been “displaced.” That has not happened, because the number of lanes in each direction (one) is the same. More important is that the areas where the buses could pull over to load/unload passengers have been eliminated. Traffic flow now backs up when a bus is stopped and vehicles cannot pass by as before. This will only get worse when the streetcars are in service. Vehicles actually have been displaced. 1 example is you can no longer turn left from Broadway onto Pine. This compresses vehicle traffic onto Pike should one need to go East. Also, street parking has been lost in some areas. Pike is is already a bottleneck at that point as it is. The bottom line is the Broadway revision has been poorly planned and we are paying the price. At the end of the day I could care less, I prefer to use 12th as it’s a much easier way to traverse the hill. Richard likes to put words in others mouth to place himself further up on his high horse. Never have I used the word or indications of any “significant” impacts. Richard is just another keyboard commando. Timmy73: I apologize, I assumed you wouldn’t be making a fuss about something if it was insignificant. Thank you for telling me differently. With your clarification in mind, I completely agree with you that restricting turns at one intersection and the loss of somewhere around a dozen total parking spaces, in the context of significant safety improvements for one of the most critical planned cycling corridors through the city, is insignificant. So, now that we agree with that, I bid you a good day! I guess I don’t really care about cars. Anything that makes it more difficult to drive is a positive for me. I think the city should do any and everything to make it more and more difficult to drive. Drivers are amoral selfish dickheads who are singlehandedly destroying the planet. Oh pu-leeze! Your hysterical statement and name-calling is arrogant to the max. I’m not a cyclist, but I do care about bicycle mobility and safety. Can’t you extend the same spirit to those who drive a car? Are these new riders who are now riding their bikes due to these new lanes – having moved away from their cars or mass transit? What are the side affects of these bike lanes (no right turns, no left turn from Broadway SB onto Pine)? Are reduced vehicle lanes creating congestion? Are we getting the anticipated ROI? As far as I can tell, there is no increased congestion along Broadway….yet. But the real test will occur once the streetcars start running….I’m sure they will slow vehicle traffic down considerably. I’m just wondering why this is the first time I’ve heard of any stats about this location or this counter when I’ve heard lots and lots of stats about the Fremont Bridge. Is that because there’s no digital readout at this location? I’m assuming these numbers will get even higher once the signs that tell you not to bike on Broadway, but instead detour over to Harvard (at least as you approach from the north) are removed. I’m a bicyclist. I have not ever, nor will I ever ride my bike down Broadway. There’s no point. I take 12th or I take Harvard (prior to all the construction blocking the streets) to go North/South. For me, both of those streets have always felt safer and less obstructed than Broadway ever did (or is now). The Broadway Bikeway is an absolute mess. No one can figure out how to park, or drive, or move, or even look to see if a pedestrian or bicyclist is coming before they open their door. There’s regularly delivery trucks and other obstructions in the bike lane and it’s filthy. It’s a complete disaster. Not too mention the Broadway Bikeway basically goes nowhere and stops suddenly. What then? There has to be hundreds of other bicyclists who know this as well, and choose other routes, because I see them, right along with me on 12th. As for the northern dead end, it’s a temporary (and poorly executed) stop – Even short term, it’s already slated to extend to Roy and then have a planned, controlled transition to separated lanes; that’s rolled into the northern streetcar extension plans being finalized right now. Then the long term plan calls for the broadway-10th cycling corridor to extend to the 520 trail – meaning, it will then serve as a dedicated cycling connector to the I-90 trail (via a small segment of 12th between Yesler and I-90), Yesler, Beacon hill, international district, first hill, central district, cap hill, 520 bridge trail, and end just south of the University bridge, allowing connectivity to University district, burke gilman… The connectivity the planned Broadway corridor provides is HUGE. It’s a disconnected component with dangerous construction zones and a bad northern ending now, but we need to keep the criticism constructive in order to keep it moving forward to what is an amazing final outcome. I went out and took a joy ride up and down the cycleway when it was announced as complete and was kind of confused by the north ending, thinking “if this is supposed to be complete, this was pretty poorly thought out” – especially entering the bike lane coming from the north, you have to cut across the northbound lane. Glad to hear they’re going to extend it further and fix it up, but they ought to come up with a better temporary solution. It’s pretty darn interesting that even an avid cyclist sees the serious problems with the bikeway. I suspect there are many more like him/her. I agree that the bikeway is filthy, even though it was recently constructed. Where is that expensive machine that is supposed to keep it clean? Has it been deployed? Richard is spot on. This cycletrack wont do much until the new extension gets built in a few years. Currently you can only use the cycletrack to get from Pike/Pine to the hospitals down Broadway (which is a route very few people needed to go). Once they extend the streetcar line to Roy/Prospect (which is in the planning stages now) a ton of people will use the cycletrack to go north on broadway where there are actual businesses to get to.